In Washington, D.C., according to EIA data analyzed by the Renewable Fuels Association, ethanol production expanded 24,000 barrels per day (b/d), or 2.5%, to an average of 999,000 b/d, equivalent to 41.96 million gallons daily. 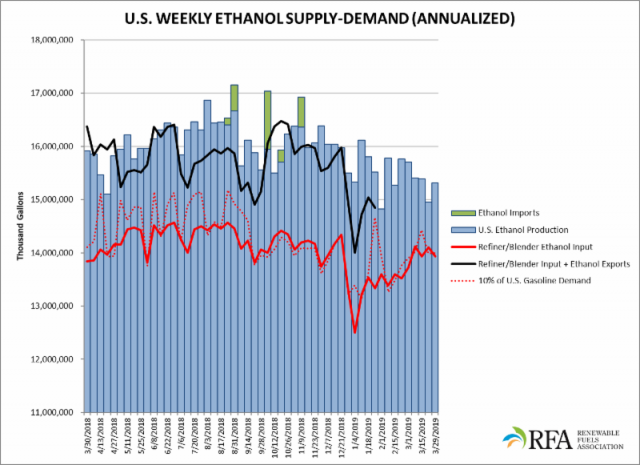 The four-week average ethanol production rate declined 0.6% to 996,000 b/d—equivalent to an annualized rate of 15.27 billion gallons. This represents the smallest 4-week average production rate in 99 weeks, and the first time since Oct. 2017 to fall below one million b/d. Gasoline supplied to the market ticked higher to 9.131 million b/d (383.5 million gallons per day, or 139.98 billion gallons annualized). Refiner/blender net inputs of ethanol decreased 1.2% to 909,000 b/d—equivalent to 13.93 billion gallons annualized. Expressed as a percentage of daily gasoline demand, daily ethanol production increased to 10.94%.